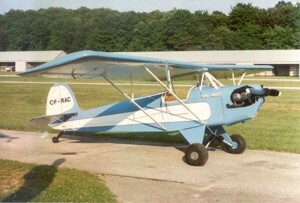 Ace Aircraft is one of the oldest kit planes on the market today. The names of "Ace" Corben, Ed Heath, and B.H. Pietenpol were synonymous with experimental homebuilt aircraft as far back as 1930. Presently, we still find the basic designs of "Ace" Corben still being built, flown and admired by those who still find the past as exciting as the designs and materials of the present. During 1935.Popular Aviation magazine published a series of articles concerning this attractive single-seat sportplane intended for construction by amateurs. A Ford Model A automobile engine was used for power, and it too was subject of an article describing modifications and needed accessories. The Super-Ace was designed by Orlan G. Corben, who had also produced other sport planes such as the Baby-Ace and Junior-Ace,Praiseworthy for simplicity and economy. The Super-Ace incorporated similar straight-forward construction philosophy combined with readily available low cost materials. Its exciting appearance and spirited performance made the Super-Ace an intriguing proposition, as did the dramatic full-colour painting by Hermin R. Bollin on the April 1935 Popular Aviation front cover. Paul Poberezny, founder of the EAA, gave renewed life to the Corben designs back in 1954 when he acquired the remains of the Corben Airplane Company. Paul deserves recognition for his role in keeping the Corben designs alive. The Baby Ace has proven to be a popular design. 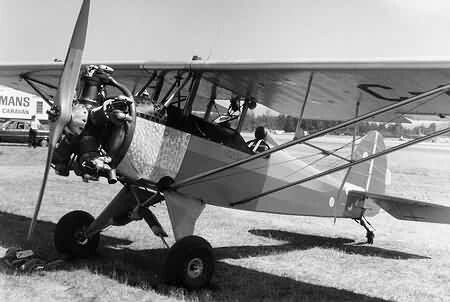 The fuselage of the open-cockpit single seater is made of steel tubing covered with fabric. The wing is made of two wood spars, also covered with fabric. The Junior Ace is a side-by-side two seater constructed in the same manner. Owners praise the designs because they are easy to build and fly. Depending on the powerplant -- typically a Continental C-65 or C-85 -- the Baby Ace will cruise at around 100 mph and climb at 1,200 fpm, according to Ace Aircraft. The Junior Ace, with a C-85, will cruise at 105 mph and climb at 500 fpm. Both aircraft have a range of about 350 miles.